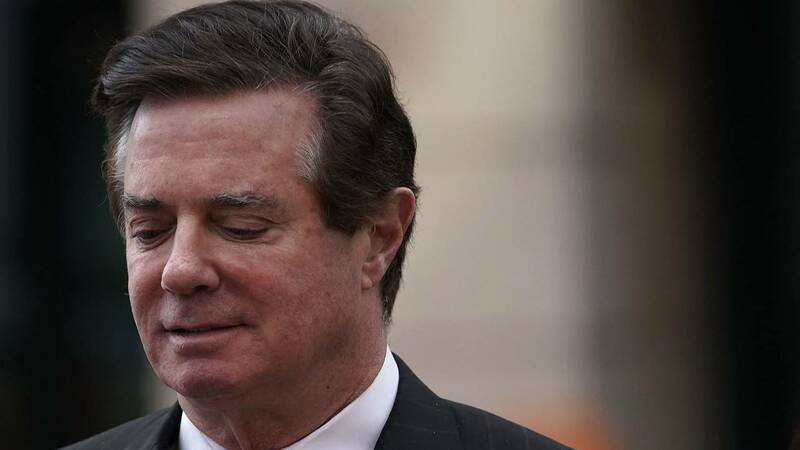 A key memo in special counsel Robert Mueller's investigation accused Paul Manafort of allegedly colluding with the Russian government when he was then-presidential candidate Donald Trump's campaign chairman in 2016 — but a criminal charge never came. The accusation is one of the most conspicuous and direct, unresolved allegations Mueller made publicly over the last 22 months and is a lingering question now that he has submitted his report to Attorney General William Barr. The accusation was revealed last April, when prosecutors submitted to a court a still-largely redacted memo then-Acting Attorney General Rod Rosenstein wrote to Mueller. The memo, from August 2017, outlined exactly what Mueller should investigate. Numerous bullet points were blacked out — more than a page in full — yet two bullet points about Manafort were publicly visible. Rosenstein directed Mueller to investigate "allegations that Paul Manafort committed a crime or crimes by colluding with Russian government officials with respect to the Russian government's efforts to interfere with the 2016 election for President of the United States, in violation of United States law." Rosenstein also directed Mueller to investigate payments Manafort received from the Ukrainian government related to his longtime client, former Ukrainian President Viktor Yanukovych. On that allegation, Manafort was charged — then was later convicted by a jury. He also admitted to related crimes. The "colluding" allegation still hasn't been resolved. Manafort's attorneys have said the prosecutors never found evidence their client colluded. A federal judge, however, at Manafort's sentencing last week said that question wasn't resolved in Manafort's court cases. "The question of whether there was or was not any coordination or conspiracy or any collusion between anyone associated with the presidential campaign and anyone in Russia was not presented in this case. Period," Judge Amy Berman Jackson said. Mueller and his team have not publicly addressed what they found -- if anything -- when they looked into this very specific subset of Mueller's broader mission to investigate Russian interference in the 2016 election and whether they made a determination on Manafort's alleged collusion. According to a court transcript, prosecutors said in a closed-door hearing that Manafort's contact with his Russian associate during the 2016 election was at the heart of Mueller's inquiry -- and Mueller left unresolved findings about that too. It's Justice Department policy not to confirm or deny the existence of specific investigations. Occasionally, the Department announces when it's investigated an allegation and declined to prosecute, such as when it looks into possible foreign bribery of corporations.